A most impressive detached bungalow situated on a site extending to c.0.9 acres on the ever popular Charlotte Street. This substantial property has been well maintained, improved upon and tweaked by the current owners of twenty seven years to afford five bedroom (two ensuite), three reception accommodation together with detached double garage and generous lawns to front and rear. Close to Ballymoney Town Centre and all of its amenities but still having that semi rural aspect. with parquet flooring, hot press, access to floored attic via slingsby style ladder, mains powered smoke alarm, telephone point. with feature polished granite fireplace, cast iron and tile inset, polished granite hearth, bay window, dual aspect windows, parquet flooring, points for wall lights, sliding doors to Dining Room. with dual aspect windows, TV point. with range of eye and low level units with tiling between, polished granite worktops, bowl and a half stainless steel sink unit, extractor fan, space for cooker, integrated fridge freezer, range connected to back boiler, plumbed for dishwasher, plumbed for automatic washing machine, space for tumble dryer, recessed lighting, partial tile and laminate flooring. with bay window, points for wall lights. Ensuite: with fully tiled walk in shower cubicle, electric shower fitting, pedestal wash hand basin, low flush WC, shaver point, fully tiled walls. Ensuite: fully tiled walk in corner shower cubicle with electric shower fitting, low flush WC, pedestal wash hand basin, shaver point, extractor fan, fully tiled walls. comprising; panel bath, bidet, WC, pedestal wash hand basin, fully tiled walls, shaver point, extractor fan. Hot press. with electric up door, pedestrian door, uPVC window, WC and wash hand basin, light and power. Property approached by sweeping tarmac driveway with turning circle, front garden laid in lawn with mature planting, hedging and shrubbery, enclosed by low level wall. Rear garden with generous paviour brick patio and pathways, additional parking area, paved pathways leading to extensive garden in lawn with mature planting, outside tap, greenhouse. From High Street, turn right onto Charlotte Street. Continue straight, Number 99 will be on your right. 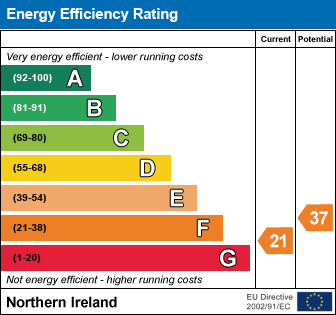 I am interested in 99 Charlotte Street, Ballymoney. Please contact me about this property.